Pirani Group of companies have launched another economical bike, super power 100 Awami. As the name suggests, it is a bike for everyday use and for masses. It is designed in such a way that it is most suitable for local roads and offers a bump-free ride. We all are well aware of the transport situation in the country along with rough, bumpy roads. However, in such circumstances, sp100 Awami new model 2019 in Pakistan is a breeze of fresh air. Exclusively for those who are looking for their own transport at a reasonable price. Yet they want a bike which gives the same feel as sports bike and is practical. For those who are familiar with Super power motorcycles, they know for the fact that the company delivers excellence. The company is not only making 2 wheelers but they have also been manufacturing 3-wheelers, tractors, and vans. The one thing which is notable about the company is that their products are reliable and durable. 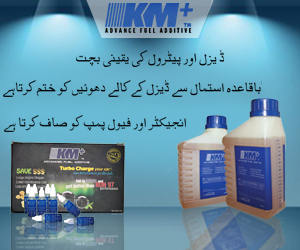 The company has also managed to bag FPCCI best export award 2010. 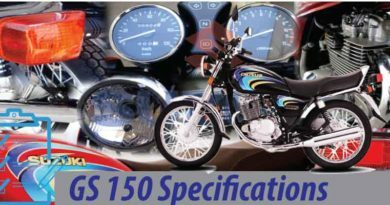 Also, the recent launch sp 100 Awami have managed to deliver the same qualities again at a reasonable price. 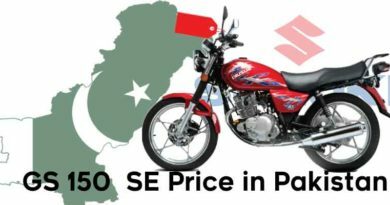 Superpower 100 Awami price in Pakistan 2019 is PKR.52000 with fairly well resale value. Superpower motorcycles can easily be found in any city. Since the company has well-established dealership network. One can easily find registered dealers through Pirani group website. Super power 100 Awami has finest of features and specifications. The bike is made of Chinese and Pakistani technology. We all are well aware of the increasing preference of Chinese bikes in the region. super power 100 Awami is a powerful looking, fine bike. It is available in red and black color with graphics stickers on the fuel tank. The illuminating, bright headlights are covered with the cowling. Superpower 100 Awami is given plastic mudguards in front and back. The black painted muffler exhaust gives bike sporty look and obviously keep the rider safe from excessive pollutants. Moreover, one thing which stands out about SP 100 Awami is its sound giving fierce, heavy bike feel. The seats of super power 100 Awami are comfortable and secure with seat bar. Letting you enjoy a stress-free ride with your loved ones. 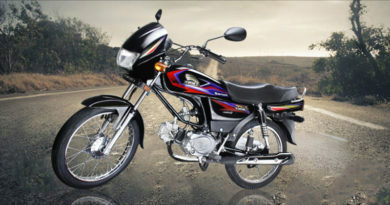 Super power 100 Awami is a bike with Chinese technologies along with Euro II technology. 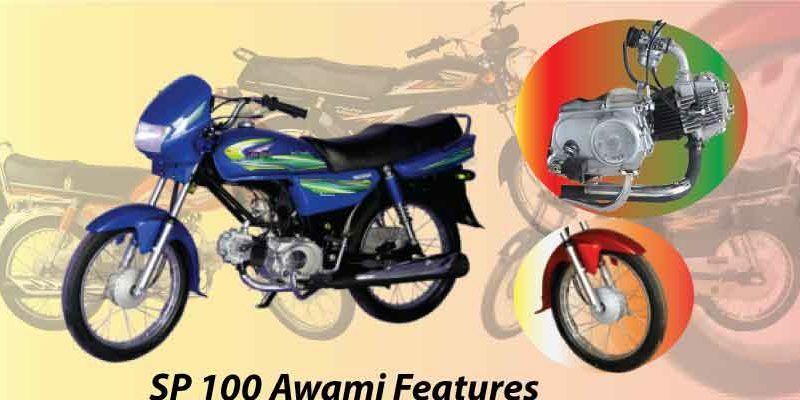 Superpower 100 Awami is available in 4 Stroke OHC, Air Cold Single-Cylinder engine and have 97cc displacement. The bore and stroke of a bike are 47.0 x 41.4 mm with a compression ratio of 8.8:1. The extreme horsepower of this beauty is 4.0 kw/7500r/RPM and extreme torque is 7.0 N.m/5000r/RPM. The CDI ignition of SP 100 Awami is CDI Electronic Control System. The bike is given wet type multi-plate clutch along with kickstart features. The frame of the bike is cradle type frame. This type of frame is most popular after backbone-type frame. The particular advantage of this type of frame is that unlike backbone-type frame, the entire weight is not on the engine. The dimensions of the Super power 100 Awami are 2680x760x110 (L x W x H). The fuel tank capacity of Super power 100 Awami is quite a lot. Sp 100 Awami is given 15liters petrol tank. Superpower 100 Awami fuel consumption or mileage is 65kmpl. The size of the front wheel is 3.0 x 18 4 PR and the size of the back wheel is 3.0 x 18 6 PR. The dry weight of Superpower 100 Awami is 106kgs. The weight is certainly little high since its 100cc bike and more weight helps to remain stable on road. Super power 100 Awami is a fine bike which can be considered as an everyday mode of transport. The bike is well designed and is sound in technology. Obviously like every other bike, Superpower 100 does require regular maintenance which will extend engine life. In respect to price, the bike is quite economical not only initial cost but fuel consumption as well. Lastly, the appearance of superpower Awami 100 is quite decent and pics of the bike can be seen above. The features and specifications of the bike make superpower100 Awami suitable for all age groups.